The Wildlife Medical Clinic has created a classroom-focused website to educate students from kindergarten through high school about wildlife, natural resources and conservation efforts by engaging the students with hands-on Internet-based lessons. CHAMPAIGN, Ill. - The Web has become a little more wild with the introduction of a website that explores human interactions with the natural world. 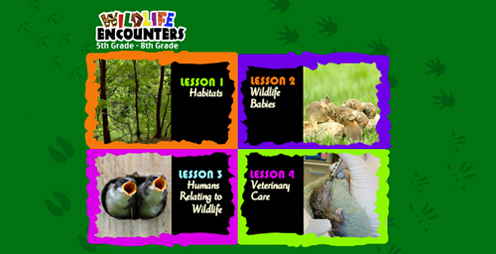 The Wildlife Medical Clinic at the University of Illinois recently created a classroom-focused website called Wildlife Encounters to educate students of all ages about the world around them. Designed to align with state standards of core curriculum, and funded through a grant from the U. of I. Office of Public Engagement, the Wildlife Encounters website seeks to educate students about wildlife, natural resources and conservation efforts by engaging the students in four sets of hands-on, Internet-based lessons. It is a free service open for public use. The lessons, covering wildlife care, medicine and conservation, are offered in three levels of complexity to meet the needs of students ranging from kindergarten through high school. A teacher resource section, including templates and post-lesson assessments, complements the lessons, allowing instructors to add to the lessons presented on the website. To augment the lessons on the website, educators can request a classroom visit by volunteers from the Wildlife Medical Clinic, who can bring live birds of prey, such as owls and raptors. The mission of the classroom interaction with the birds of prey is simple, said Dr. Julia Whittington, a professor of veterinary clinical medicine at Illinois and a developer of the website. "The students can really take home the lesson of environmental stewardship when they see the birds in person." There are plans to expand the website and to create more varied types of lessons. The clinic has teamed with the Anita Purves Nature Center in Urbana to develop toolboxes for educators, which would enhance the Web-based lessons through hands-on activities, such as owl-pellet dissection kits. Additionally, the clinic hopes to create educational videos to complement the lessons on the website as well as educate the public about how to interact with wildlife. "These videos would be like public service announcements, addressing topics such as seeking care for a wounded animal, and giving the public a resource to learn from," Whittington said. Since its founding in 1978, the Wildlife Medical Clinic has a rich history of public interaction, outreach and education, and the Wildlife Encounters website is an extension of this philosophy. "We have a three-pronged purpose," Whittington said. "We provide veterinary care to wild animals while offering students an opportunity to gain valuable experience. But just as important is our effort to support conservation initiatives and engage the community in awareness of our natural resources and how our activities impact our environment."